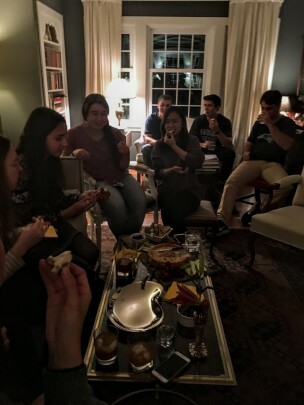 When my husband and I hosted an annual supper last week for his freshman class at Amherst College, I served a familiar menu, one I’ve cooked for more than a decade. A vegetarian dish of rigatoni tossed in a spicy tomato sauce again anchored the meal partnered by a mixed greens salad and warm crusty bread. 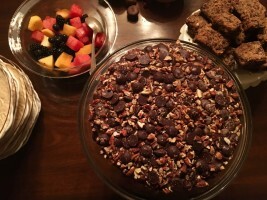 As usual, for dessert I set out a bowl of fresh berries and fruit along with several chocolate treats, including a chocolate caramel cake and chocolate almond shortbreads. When it came to appetizers, though, I decided to try a new opener—a savory Gorgonzola cheesecake garnished with apple wedges, toasted croutons, grapes, and some fig jam. Right before the young people arrived, I had a moment of panic. What if this new cheesecake offered as an opener rather than a dessert was a flop. What if the students were not adventurous eaters and the dish was untouched. Fortunately, I didn’t have to worry long! 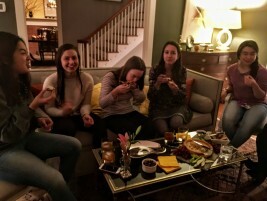 From the moment the group gathered around our coffee table in front of a roaring fire, they enthusiastically began sampling this Gorgonzola creation. They took seconds and thirds, spreading the creamy blue cheese mixture onto toasted baguette slices or apple wedges. Some spooned fig jam atop the cheese mixture while others added grapes to their servings! When one student asked for the directions for the dish, I knew it was a hit. Perfect for the holidays, since it can be prepared two days ahead and easily serves 20, this cheesecake has a walnut crust and a silken smooth Gorgonzola and cream cheese filling scented with rosemary and black pepper. It makes a striking appearance garnished with seasonal fruits, crisp toasted bread slices, or crackers. A small bowl of fig or other fruit jam adds a distinctive note. Serve it at an open house, take it to a potluck, or bring it to your workplace, and watch (then smile) as you see it disappear! 1.Arrange a rack in the middle of the oven and preheat oven to 350 degrees F. Spray a 9-inch springform pan with nonstick spray. 2. Combine ground walnuts, panko crumbs, flour, and salt in a medium bowl. Add the melted butter and mix well. Pat the mixture evenly onto the bottom of the pan. Place pan on center shelf of the oven and bake until set, about 10 minutes. Remove from the oven, but leave the oven on. 3.With an electric mixer on medium speed, beat the cream cheese, Gorgonzola, rosemary, pepper, and salt in a mixing bowl just until creamy and smooth, 11/2 minutes or longer. Stop the machine to scrape down the sides of the bowl with a rubber spatula as needed. Reduce speed to low and add cream. Add eggs, one at a time, mixing just to blend and stopping to scrape down sides as needed. Pour the batter into the springform pan and smooth the top with a spatula. Place the pan on a baking sheet. Market note: I particularly like to use Mountain Gorgonzola, available at Whole Foods and other supermarkets. 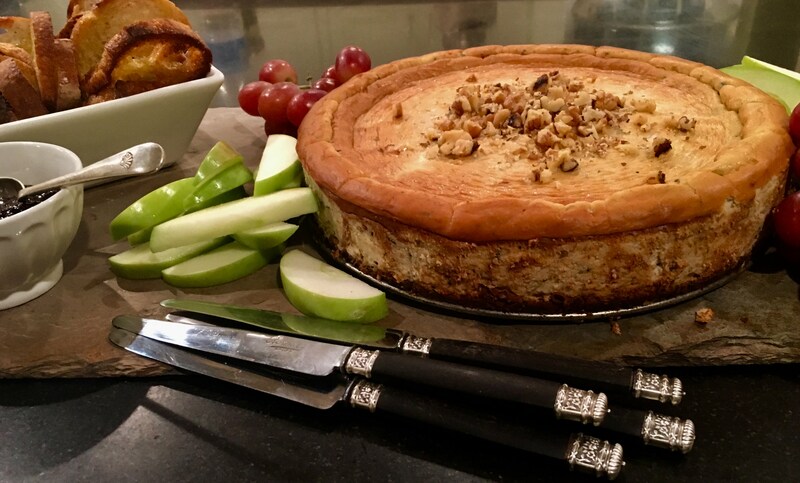 This entry was posted in Food News and tagged appetizer, gorgonzola, holidays, savory cheesecake by brosbottom. Bookmark the permalink. Cannot wait to make this for Christmas day! Tired of always bringing the same 3 or 4 appetizers I always make. I know this will be a hit. So happy you’re going to try it. You really can make it a day or two ahead so no last-minute work. Be sure to have Gorgonzola, cream cheese, and eggs at room temp to prevent beating too much air into the cheesecake. Hope your family likes it as much as I do! Merry Christmas and a wonderful 2018 to you! Looks amazing…but what exactly does the measurement pds stand for in the cream cheese? “pds” is for pounds –you need three 8-oz packages of cream cheese which is 1 1/2 pounds. I was confused too. Better to say, three 8 oz packages of cream cheese. I edited the recipe so it reads “1 1/2 pounds (three 8-oz packages) cream cheese.” Thanks for your input. I think it’s nicely balanced. I started with much more Gorgonzola, but reduced it to 4oz and liked that amount. Hope this helps! The recipe calls for 12 oz – is it 12 or 4 oz? Yes, 12 ounces is the correct amount of Gorgonzola. You need that amount to have a nice flavor of the cheese. Betty thoughts on making this smaller? Or can it be frozen if there are leftovers? I have one whole cheesecake (made in my cooking class on this Wed) in the freezer and I think it will be fine if defrosted overnight in the fridge. BTW the gorgonzola cheesecake leftovers from the student party last week are still tasting good when I nibble on them! Hope you have a wonderful Christmas and holidays! Sounds Fabulous!! Was wondering if it might keep 3 days? Would love to bring Christmas Eve if kept refrigerated from 22nd. We will be out of town 2 days before Christmas? Yes, I think it will be fine. I have made it up to 2 days ahead, but my leftovers from the student party were delicious after 4 days! Hi Betty- Every December a group of 6 friends ( who celebrate our birthdays through out the year) invite our husbands to join us for a Christmas party! Always a festive event! I was charged with the appetizer course for this year’s dinner and when I saw your post describing the Gorgonzola Cheesecake I stopped searching for an idea! It was perfect—delicious and a wonderful holiday presentation! Everyone loved it! Thank you so much! Thank you so much for your note. Every food writer (myself included) loves to hear that readers have made their recipes successfully! pun!). Hope 2018 is filled with good for you! I have mini spring form pans. I I’d like to make this as an appetizer for my dinner party in late March. Do you think I can 1/2 the recipe and it would work? Would that change the baking time? You can certainly halve the recipe, but I can’t tell you how many of your mini-cheesecake pans you can fill since that will depend on their size. When I tested the recipe, I did it in small batches and the baking time was about 30 minutes. I’d suggest starting to check the smaller ones after 20 or 25 minutes. I was wondering if you could skip the crust for this recipe. I’ve had Gorgonzola cheesecake at a winery and did not have a crust. The crust is especially good and provides a nice contrast with its crispness to the creamy, smooth cheesecake. If you omit it,you might want to wrap bottom of cheesecake pan with foil in case mixture leaks. Hope this helps. Yes, thank you! However, I didn’t have any leaks. I hope this turns out okay. I picked up 3 Gorgonzola cheeses in tubs (so I thought). They were 4oz each. When I got home I realized one of the tubs was Bleu Cheese. I didn’t have time to go back to the store and get one more Gorgonzola tub. I’m going to a wine tasting so I hope it’s good. Wonderful recipe you submitted! Hi, Wonderful recipe Betty. I made this for Thanksgiving last week and wondering if it is still good. There is some left over. Your recipe says can be made up to two days ahead, so that is why I am asking.